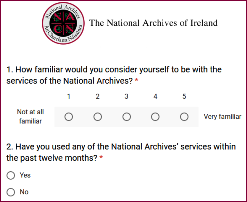 The National Archives of Ireland (NAI) is calling for a few minutes of your time to participate in a brief online survey. A Masterplan is being developed for the public spaces of the NAI, and users input would be valuable to the process. I've completed the survey. It's just eleven questions long and took about five minutes. All surveys are treated confidentially. Your email address is requested only for validation purposes and to send you a copy of your responses. To take part, go to http://www.nationalarchives.ie/2018/11/national-archives-user-survey/ before Monday 3 December.